I literally grew up eating McD's. No joke! I remember eating it often and I even got the occasional lunchtime delivery at Elementary school. Yes, there were some envious classmates and even the teacher stole some of my fries. I'm not sure if this was the healthiest of diets, but hey, I loved it. One of my favs is the McMuffin. Something so simple, which could be replicated at home, I always seem to crave it. 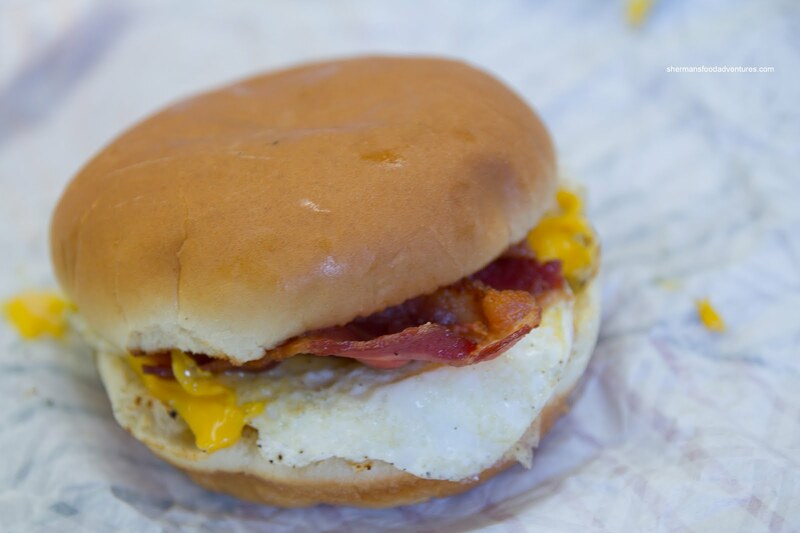 However, there are so many other fast food breakfast sammies out there and they never seem to measure up. So I decid ed one day to compare all of them to see which one reigns supreme! 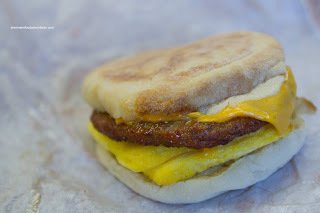 The English Muffin with sausage at BK tries to emulate the classic from McD's but it fails miserably. First of all, the muffin is not toasted which meant it would spongy and cold. Secondly, the folded scrambled egg has only one texture (rubbery) and does not have that contrast between the white and yolk. The sausage is meatier than the one from McD's which meant a bit less fat. It is also saltier too. The Croissant version is better since the "bun" is soft and buttery. The sandwich at A&W is probably my least favourite since they use a regular hamburger bun. Now that is not unusual since Triple O's does the same, but the fact there is no sauce, it makes the whole thing really dry. 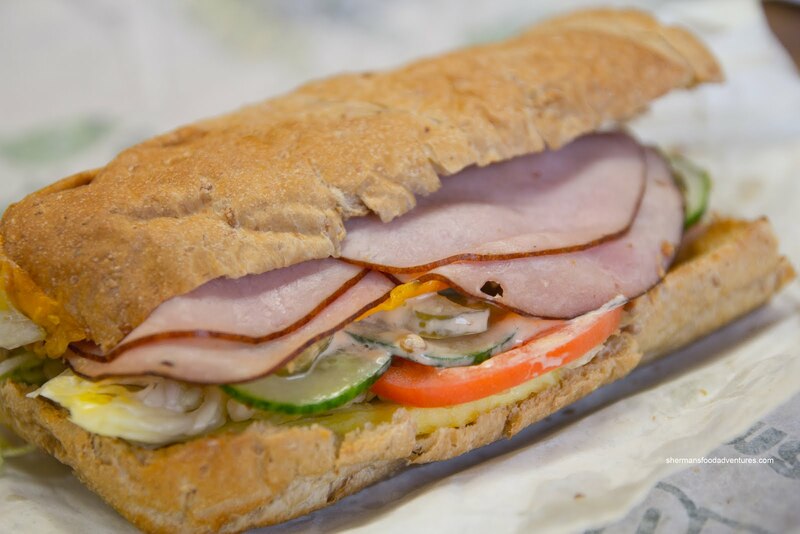 Furthermore, it stretches out the ingredients which makes the sandwich feel like it doesn't have much substance. I don't particularly like how they prepare the egg since it ends up looking more like a fr itatta. From Triple-O's, we have the classic Sunny Start. I remember downing 3 of these easy as a kid at White Spot. I'm sure my parents were horrified with needing to order 3 of them. 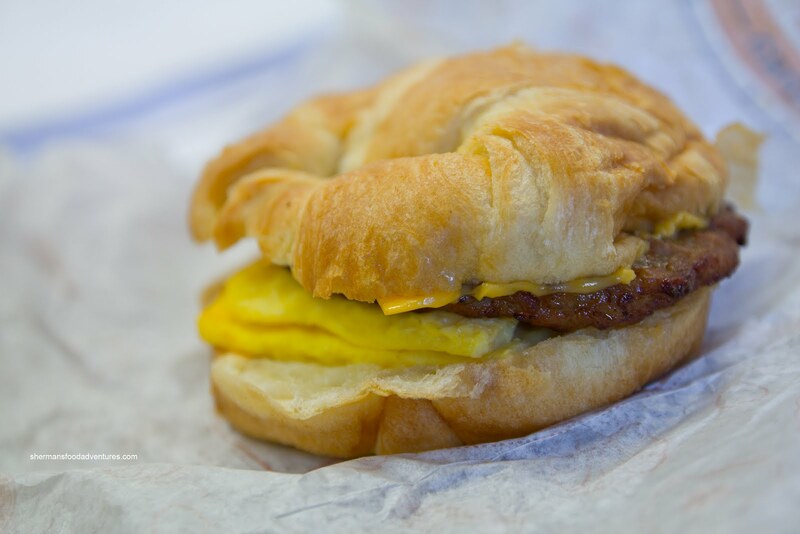 This is obviously the most expensive of the fast food breakfast sandwiches. It consists of a fried egg, processed cheese, bacon (or sausage) and Triple-O sauce on a regular hamburger bun. The thing that makes this better than the A&W sandwich is the bun. It is much softer and less dense. Therefore, the other ing redients are actually discernible. Furthermore, they don't skimp on the bacon and as with any White Spot sandwich, there is an obscene amount of Triple-O sauce. From probably one of the unhealthiest breakfast sammies to the healthiest, I got the 6-inch Breakfast Sub from Subway consisting of a microwaved egg omelet with choice of cheese, meat and veggies. I went for ham along with tomatoes, lettuce, cucumbers, pickles and olives with Southwest dressing. This was easily the largest of the sammies while also being the most bland (despite the dressing). It is also probably the healthiest despite the cheese and the dressing. Although it still might be close calorie-wise. Although it filled me up, there was less satisfaction eating it than the others. To make the Subway one even more healthy, you can get egg whites instead of egg which brings the fat/cholesterol levels down considerably. Adding southwest sauce kind of negates any healthy benefits this breakfast sandwich has..... it's probably better to add a couple strips of bacon to add flavour than to add any creamy sauces. PS... did you try any of the Starbucks sandwiches in your testing? I think they have some interesting and healthier options. PPS... I grew up loving the McDonald's sausage and egg mcmuffin.... it really can't be replicated at home since I've never found any sausage patty that comes close to the ones they use. And the one which reigns over them all is? My guess is the MçD's, which is also the one I go to when I'm craving a breakfast sandwich and don't have the ingredients at home to make one. There is a contender missing here: Timmy's. Their is actually quite good and could easily match McD's! 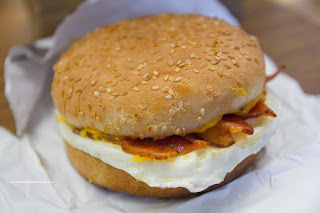 From a taste perspective, I prefer the McD's with the biscuit and folded egg; however, that sandwich is a waist killer. @Holly I love the McD's one for now! @KimHo Yup, gonna add Timmy's eventually. This is ongoing!